would raise the threshold for overtime exemption from $23,660 to $35,308 for the “white collar exemption” (the 2016 proposal was $47,476) and from $100,000 to $147,414 for Highly Compensated Employees (the 2016 proposal was $134,004). would allow the thresholds to be updated every 4 years after a consultation period (currently there is no renewal mechanism built in – the last update was in 2004; the 2016 proposal called for a binding regular update, and is likely the component allowing a successful legal challenge that ultimately stopped the update from coming into effect). When the commenting period begins, we will post the link to the Federal Register here. National Institutes of Health: continuing plans to raise NRSA stipend levels – see here. Arizona State University: continuing plans to raise salaries – for the “majority” of postdocs (unclear what this means). Boston Children’s Hospital (Massachusetts): continuing plans to raise salaries. Boston University (Massachusetts): continuing plans to raise salaries – see here. Brigham and Women’s (Massachusetts): reversed plans and are now continuing plans to raise salaries, after initially cancelling plans to raise salaries. Burke Medical Research Institute, Weill Cornell (New York): cancelling plans to raise salaries. Dana Farber Cancer Institute (Massachusetts): continuing plans to raise salaries. Dartmouth College: continuing plans to raise salaries. Duke University (North Carolina): continuing plans to raise salaries. Emory University (Georgia): continuing plans to raise salaries. Florida State University: continuing plans to raise salaries. Harvard Medical School (Massachusetts): continuing plans to raise salaries. Harvard T.H. Chan School of Public Health (Massachusetts): continuing plans to raise salaries BUT explicitly have stated there will not be raises for those paid on external stipends. Icahn School of Medicine at Mount Sinai (New York): continuing plans to raise salaries to $50,000 minimum. Iowa State University: continuing plans to raise salaries to lower levels, see here for more info: “We revisited and approved the salary increases to reach above the minima by 2018” after cancelling plans to raise salaries – actually paid postdocs at Dec 1st at FLSA min and then were reducing any postdocs whose salary was not updated in a renegotiation of their contract to the levels stated here (beginning at $44,100 for 2017). Johns Hopkins (Maryland): continuing plans to raise salaries. Joslin Diabetes Center (Massachusetts): continuing plans to raise salaries. Loyola University (Illinois): cancelling plans to raise salaries. Massachusetts General Hospital: continuing plans to raise salaries “As of February 1, 2017, MGH postdocs had their salaries aligned with the NIH FY17 guidelines, bringing any salaries that were below the original FLSA requirement up to that minimum. Prior to that date, MGH postdoc salaries were mandated to follow earlier NIH guidelines. Note that our salary policy is for Mass General Hospital only, and is not exactly aligned with Harvard (Medical School or University)” – previously, delayed plans to raise salaries after original indications that they were continuing plans to raise salaries, when injunction came into effect. Massachusetts Eye and Ear Infirmary: delaying plans to raise salaries. Massachusetts Institute of Technology: continuing plans to raise salaries. Massachusetts Institute of Technology Department of Brain and Cognitive Sciences: continuing plans to raise salaries (salaries already exceeded FLSA minimum and negotiated by postdocs already). Michigan State University: cancelling plans. Northwestern University (Illinois): continuing plans to raise salaries. Ohio University: cancelling plans to raise salaries. Oregon Health and Science University: continuing plans to raise salaries. Rutgers University (New Jersey): cancelling plans to raise salaries. The Scripps Research Institute (California): continuing plans to raise salaries. Stanford University (California): continuing plans to raise salaries (salaries already exceeded FLSA minimum). Temple University (Pennsylvania): continuing plans to raise salaries. Tufts University (Massachusetts): continuing plans to raise salaries. University of Alabama Birmingham: continuing plans to raise salaries. University of Arizona: continuing plans to raise salaries, effective 7/1/2017. University of California: continuing plans to raise salaries (already negotiated in contract with postdoc union). University of Central Florida: continuing plans to raise salaries. University of Chicago: continuing plans to raise salaries. University of Colorado Boulder: continuing plans – see here. University of Colorado Denver: continuing plans to raise salaries. University of Delaware: continuing plans to raise salaries – see here. University of Florida: continuing plans to raise salaries. University of Illinois system: generally confusing and poorly administered: continued plans to raise salaries as of 12/5, after cancelling plans to raise salaries on 11/23. However they have reduced the salaries for new hires: “any NEW Postdoctoral Research Associates must be paid at least $43,000 annually. Units have discretion to pay above the floor if funds are available.” We have however had reports of “new” affecting postdoc contracts being renewed and treated as new hires. University of Iowa: cancelling plans to raise salaries, apparently this has been mandated by the State of Iowa and they are returning to their previous policy that postdocs can be paid no less than 5% below NIH NRSA. However they have not yet replied to a request for clarification if this will be set to the new NIH NRSA levels, which begin at the FLSA minimum anyway. Clarification on 1/12/17: this WILL be based on the new NIH NRSA levels. University of Louisville (Kentucky): continuing plans to raise salaries. University of Kansas: continuing plans to raise salaries. University of Kentucky: continuing plans to raise salaries. University of Maryland: cancelling plans to raise salaries. University of Massachusetts Medical School: cancelling plans to raise salaries but allowing individual PIs to decide. University of Memphis (Tennessee): continuing plans to raise salaries. University of Michigan: letting individual departments/units decide but generally continuing plans to raise: UMich is leaving it up to individual “units” (i.e. each college, institute). However, IF they decide to move forward (most postdocs will be getting the minimum; there are only a few colleges/institutes left), UMich will provide some bridge funding as an incentive. 12/16: faculty at college of LSA have heard raises will go ahead, some admins are hearing mixed things, postdocs at the Medical School have heard that they will benefit from continuing plans to raise salaries, after initial indications they were cancelling plans to raise salaries (see here). University of Minnesota: somehow, possibly both? They are raising salaries as planned, see press story. However they have apparently informed postdocs that this may be reversed, depending on the outcome of the injunction. On 12/20/16 they cancelled raises for all staff groups except postdocs. University of Nebraska-Lincoln: cancelling plans to raise salaries. University of Nevada Reno: continuing plans to raise salaries. University of Nevada Las Vegas: cancelling plans to raise salaries. University of New England (Maine): continuing plans to raise salaries. University of North Carolina Chapel Hill: continuing plans to raise salaries. University of North Carolina Wilmington: cancelling plans to raise salaries. University of Notre Dame (Indiana): continuing plans to raise salaries for current postdocs; looking into whether to create a new standard salary minimum. University of Pittsburgh (Pennsylvania): continuing plans to raise salaries. University of South Florida: continuing plans to raise salaries. University of Tennessee Health Sciences Center: continuing plans to raise salaries. University of Texas Rio Grande Valley: cancelling plans to raise salaries. University of Texas Southwestern: continuing plans to raise salaries. University of Virginia: continuing plans to raise salaries. University of Washington: continuing plans to raise salaries. University of Wisconsin Madison: continuing plans to raise salaries. University of Wisconsin Milwaukee: delaying plans to raise salaries. University System of Georgia: continuing plans to raise salaries – see here. Washington University in St. Louis (Missouri): continuing plans to raise salaries. Wayne State University (Michigan): cancelling plans to raise salaries, and in doing so appear to be claiming that they are being forced to do so by the injunction, which is not the case. Whitehead Institute for Biomedical Research (Massachusetts): salaries already exceed FLSA minimum. Woods Hole Oceanographic Institute (Massachusetts): salaries already exceed FLSA minimum. Yale University (Connecticut): continuing plans to raise salaries. Northern Arizona University: “Our Post-Docs were already earning over the threshold, so we did not have any plans in place that we had to reconsider. University at Buffalo, State University of New York: dealing with postdocs “on a case-by-case basis”. Washington State University: cancelling plans to track hours – see here. Beth Israel (Massachusetts): not raising salaries. Case Western Reserve University (Ohio): raising salaries. Clarkson University (New York): raising salaries. Clemson University (South Carolina): No updates as of March 2017. Donald Danforth Plant Sciences Center (Missouri): raising salaries. Mayo Clinic School of Medicine (Minnesota): raising salaries. Oklahoma State University: not raising salaries and continuing with plans on tracking postdoc hours. Rosalind Franklin University of Medicine and Science (Illinois): raising salaries. Salk Institute (California): not raising salaries – note that Salk is affiliated with University of California San Diego, where the postdoc union has negotiated a raise in the contract for postdocs to the new NIH NRSA levels at +2 years beyond the number of years experience the postdoc actually has. St Jude Children’s Research Hospital (Tennessee): now raising salaries as of 12/22/16, starting at $48,435 (see website here), after initial indications they would not be raising salaries (their website previously claimed that, “Postdoctoral fellows at St. Jude Children’s Research Hospital are not required to bring their own funding and are compensated with a competitive salary above the recommended NIH levels,” and as their salary levels were now below NIH NRSA levels we were curious as to whether that would change, and it has). Louisiana State University: not raising salaries. Louisiana State University Health Sciences Center – Shreveport: now planning to raise salaries (as of December 9) after recently contacting postdocs to say that they were not raising salaries. Montana State University: postdocs report receiving notification that they would get raises, but it was never implemented and once the injunction came through, the raises have been put on indefinite hold. Montclair State University (New Jersey): no response received. New York University: raising salaries. Thomas Jefferson University (Pennsylvania): raising salaries. University of Arkansas at Pine Bluff: their one postdoc already paid above $47,476. University of Connecticut: not raising salaries. University of Missouri: raising salaries. University of Missouri-St Louis: raising salaries. University of Texas Health Science Center at Houston: raising salaries. University of Texas Medical Branch at Galveston: raising salaries. University of Vermont: not raising salaries/no overall strategy. Virginia Tech: Unwilling to share identifiable information. On December 1st, 2016, the threshold at which salaried workers receive overtime payment for working more than 40 hours per week was due to increase from $23,660 to $47,476 per year, under updates to the Fair Labor Standards Act (FLSA). This was delayed by an injunction granted November 22nd (see here for more information) and has now been declared invalid as of August 31st by the same court. All postdocs working in the U.S. who are not in a primarily teaching role, were due to come under this ruling, regardless of visa or fellowship status (although certain institutions – Brown University, Brandeis University, Rutgers University – were claiming postdocs on fellowships to be exempt from the FLSA). Therefore institutions who did not currently pay their postdocs above this threshold would either have to choose to track the hours of a postdoc, or to raise salaries to the new threshold. We hoped that institutions would raise salaries rather than track hours – the cost would likely be less to the institution by avoiding administrative burden, and tracking hours runs counter to academic culture. However survey and report suggested that there were institutions considering hours tracking and we decided to prepare resources for postdocs to provide as much information as possible, and find out what institutions were planning, as detailed in the “Institutions and Funding Agencies: What are they doing” tab below. We have updated as far as possible – and still ask for your help to continue doing so – how institutional plans may have changed as a result. Please contact us at info@futureofresearch.org to provide comments and information, and ask questions. On 11/17/2016 the first version of our paper on institutional plans for implementation of the FLSA with respect to postdocs was published: Monitoring the compliance of the academic enterprise with the Fair Labor Standards Act is up on F1000Research. The talk is freely available for use and downloading, the slides are available on the F1000Research FoR Channel and discussed here on Reddit. Please feel very free to present this at postdoc association events and to spread the resources around your postdocs and other postdocs you know. “Re: Notice of Proposed Rulemaking; Defining and Delimiting the Exemption for Executive, Administrative, Professional, Outside Sales and Computer Employees (80 Fed. Reg. 38515, July 6, 2015) (RIN 1235-AA11)” College and University Professional Association for Human Resources (CUPA-HR). “DOL’s Proposed Overtime Rule: Higher Education’s Comments & Concerns” College and University Professional Association for Human Resources (CUPA-HR). NOTE: THIS IS INFORMATION COLLECTED PRIOR TO THE INJUNCTION, OF INSTITUTIONAL INTENTIONS. FOR CURRENT, POST-INJUNCTION PLANS, PLEASE SEE THE FIRST TAB ON THE PAGE, JUST BELOW THE INTRODUCTION AND INFOGRAPHIC. A recent report suggests that 75% of institutions surveyed are considering raising salaries, and 25% are considering hours reporting. National Institutes of Health NRSA Stipends: NIH is raising its stipends above the FLSA minimum effective December 1st. See info here on applying for supplements to raise salaries: NOT-OD-17-002. Howard Hughes Medical Institute: HHMI raised their minimum postdoc salary to $50,000 for those at year 0 experience level, effective November 1. This goes up $1,000 for every year of experience. The new salary applies for all postdocs at the Janelia campus and those in HHMI labs paid from HHMI funds. University of Alabama Birmingham: Raising salaries. “In light of these changes, the University is setting a new minimum salary for postdoc trainees and postdoc employees of at least $47,500 beginning December 1, 2016. This change recognizes the hard work of postdocs and maintains their FLSA exempt status.” The document however then goes on to reveal plans to have postdocs pay 25% of their health insurance costs from January 2017 – estimated to be $900-$3000 per annum. University of Alaska: Still deciding. 11/10/2016: “UA is currently finalizing a message and notifications to departments, supervisors and employees that will be sent out soon. There are a few factors in making a determination on how these will be handled for example- is the position full or part-time.” No information clearly available other than student employment guidelines and advice on adjuncts who are not primarily teaching, where hours are being tracked. Contacted 10/14/2016. University of Arkansas: Still deciding. No information on postdoc salaries, contacted 10/14/2016. Reply received from HR on 10/15/2016: “At this point we are undecided; however, it looks like at least a number of postdocs may have salary increases.” Info on hours tracking here. University of Arkansas for Medical Sciences: Unknown. No information on postdoc salaries, contacted 10/14/2016. Beckman Research Institute of the City of Hope: Unknown. 10/30/2016: Declined to release information; 11/5/2016: Our request was referred up the chain of command. Caltech: Unknown. No specific info, contacted 10/14/2016. Stanford: Salaries already exceed minimum. Postdocs on $51,600 annual salary as of October 1 2016. “In our new contract, as of Dec 1, 2016 all postdocs will be paid at least NIH+2 steps on 2017 scale, so the new minimum salary will be $48,216 (Step 2 on the 2017 scale). A small number of postdocs who choose to work less than 100% time (such as for outside employment or family care responsibilities) may fall under the OT threshold – these will be paid hourly at or above the same rates as exempt postdocs (NIH+2 steps scale converted to hourly), and our contract has protections to ensure these part-time postdocs are treated fairly and compensated in accordance with the law. Both the Union and UC expressed interested in minimizing the number of part-time postdocs to keep as many postdocs exempt as possible. University of Connecticut: Unclear. Contacted 10/28/2016. 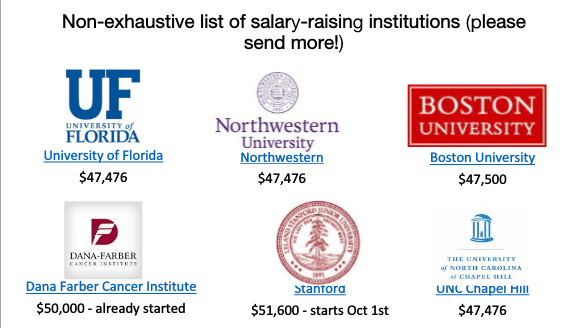 Yale University: Raising salaries, according to informal contacts. 10/14/2016: Information not updated although it does state, “This scale will be adjusted again on December 1, 2016 to comply with changes to the Fair Labor Standards Act that take effect on that date,” suggesting that perhaps the intention is that salaries will be raised. Delaware State University: Unknown. No information on website about postdocs, contacted 10/14/2016. Georgetown University: Unknown. No information, contacted 10/14/2016. University of Florida: Raising salaries. University provides salary increases for postdocs to a minimum of $47,476 by December 1, 2016, and increases minimum salary requirement for newly hired postdocs to $47,476 as of July 1, 2016. Scripps Research Institute Florida: Unknown. Information not clear, contacted 10/14/2016. Emory University: Raising salaries? A post at Emory seems to suggest that salary raises will be required on current grant-funded salaries and for future hires, and that all postdocs regardless of funding source should be treated the same. Contacted 11/04/2016 for clarification. Georgia State University: Unknown. Postdoc-specific information does not clarify whether institution mandates raising salaries or tracking: “Postdoctoral researchers in the sciences are not covered by the teaching exemption. These employees are generally considered professional employees and are subject to the salary threshold for exemption from overtime. Postdoctoral researchers in the humanities also teach. To the extent that they have a primary duty of teaching, they will be subject to the teaching exemption and not entitled to overtime compensation. If they do not teach, however, and earn less than the new threshold, they will be eligible for overtime.” Contacted 10/17/2016. Georgia Tech: Raising salaries. FLSA information does not specify postdocs except for a memo from President Peterson that says salaries will be raised for postdocs. University of Hawaii: Unknown. There appears to be no information on postdocs on the website. Contacted 10/14/2016 asking for FLSA/postdoc information. University of Illinois Chicago: Still deciding. Unclear as to what postdocs earn and what FLSA means for postdocs. Institution contacted 10/05/2016. No update as of 10/14/2016. No decision made yet as of 10/18/2016. University of Indiana: Unknown. Information not updated for FLSA – currently suggests minimum of 90% NIH NRSA minimum, which is not a feasible policy as of Dec 1st. Not updated as of 10/14/2016. Indiana University School of Medicine: Unknown. FLSA information does not mention postdocs, says affected categories will be contacted mid-October, as of 10/05/2016. Contacted 10/05/2016. Eastern Kentucky University: Unknown. No postdoc-specific information on FLSA website. Contacted 10/17/2016. University of Kentucky: Unknown. Information not yet up for postdocs as of 10/05/2016 (informal discussions recently suggested may not be compliant by Dec 1st). Louisiana State University: Still deciding. No information on website, contacted PDA 10/14/2016. Informal contact on 10/17/2016: No decision yet made. Contacted HR 10/17/2016. University of Louisiana at Lafayette: Unknown. No information on website, contacted 10/14/2016. Tulane University: Unknown. No postdoc-specific information on FLSA website. Contacted 10/17/2016. Johns Hopkins: Raising salaries. Informally have heard that postdoc salaries will be raised, checking as of 10/31/2016, some more FLSA Hopkins info here. 10/14/2016: Salary info not updated in line with FLSA. However informally it has been communicated that while not yet official, it is expected that salaries are to be raised. HR contacted 10/18/2016. Brandeis University: Raising salaries. “As of December 1, 2016, the minimum stipend for a Postdoctoral Associate at Brandeis University will be no less than $47,484 annually or $3,957 monthly.” However as discussed in our blog post here of 10/11/2016, Brandeis seems to take the line that postdocs on training mechanisms are somehow exempt from the ruling. Emailed 10/11/2016 for clarification, no reply received as of 10/14/2016. Brigham and Women’s Hospital: Unknown. Information not updated for FLSA as of 10/06/2016. Dana-Farber Cancer Institute (DFCI): Salary already exceeds minimum. Institute raises postdoc salary scale to a starting minimum of $50,000 as of July 1, 2016, with institutional support over a 5-year transition period (independently from FLSA as a result of PDA Advocacy efforts over the last 3 years). Harvard University: Raising salaries, informed informally 10/31/2016. Postdoc salary info generally not visible/clear on 10/06/2016. On 10/14/2016, still no clear salary info although the NIH NRSA stipends are pointed out. Joslin Diabetes Center: Unknown. No information on postdoc salaries as of 10/06/2016. Massachusetts General Hospital: Unknown. Salary information not publicly available as of 10/06/2016. MIT BCS (Department of Brain and Cognitive Sciences): Salary already exceeds minimum. Department raises postdoc salary to a starting minimum of $51,120 (NRSA PGY4 FY2016) as of July 1, 2016, with departmental support over a 2-year transition period (independently from FLSA as a result of PDA Advocacy efforts). Tufts University: Raising salaries. 11/05/2016: “Salaries for full-time postdocs will be increased to the new minimum.” Taking the line that as postdocs are currently exempt, they should continue to be exempt and so have salaries raised. Those on fellowships/foreign grants who below the FLSA minimum must also have their salary raised to meet the minimum. Whitehead Institute for Biomedical Research: Salaries are already above the FLSA minimum, beginning at $50,127 as of 2012. University of Mississippi: Unknown. Information not updated for FLSA, current minimum $42,840. Contacted 10/14/2016 for information. Washington University in St. Louis: Raising salary. Salary information has not been updated for the FLSA, contacted 10/14/2016 for information: “The WU School of Medicine minimum postdoc salary/stipend amount for FY17 (July 1, 2016 to June 30, 2017) is $42,840.” Informally have heard on 10/15/2016 that salaries will be raised. Montana State University: Unknown. No information; contacted 10/14/2016. University of New Hampshire: Raising salaries. State University of New York, Stony Brook: Raising salaries. “Stony Brook officially raises the salary minimum for research grant-supported postdocs in order to maintain their exemption from overtime.” Previous information: “Where base salaries cannot be increased, the supervisor or PI must authorize/monitor and pay employees for all hours worked including any time worked over 40 hours per week. Alternatively PI’s may wish to review and adjust employee schedules to ensure that the work week does not exceed 40 hours. Please note that you may not allow or expect non-exempt employees to work more than 40 hours per week without paying overtime.” It is not yet clear whether Stony Brook has a clear policy, but it appears to be letting PIs decide salaries. Information not updated as of 10/5/2016. Contacted HR 10/19/2016. University at Buffalo, State University of New York: Trying to raise salaries but also allowing tracking of hours. 11/07/16: “UB will be approaching this on a case by case basis. We have met with all of our PI s to lay out options and implications. For all future and current proposals, we are putting in post docs and many laboratory staff positions above the new minimum threshold. For current grants – we are assisting our sponsored programs office folks to work with PI s to try and re-budget to raise the salaries. We believe that will not be possible for all of them. We are having meetings with individuals directly impacted over the next 3 weeks to go through time tracking and work behavior changes that will occur all across our campuses.” Information not updated for FLSA. Not updated as of 10/05/2016. 10/14/2016: FLSA checklist up for managers but salary level still at minimum of $30,000. The City University of New York: 10/14/2016: Raising salaries. info updated: postdoc salaries will be raised to $47,484 minimum. Cornell University: Raising salaries. policy announced on 9/1/2016: “For postdoctoral associates at Cornell, based on the final rule we have confirmed that an hourly position is not appropriate and will not be available. Postdoctoral associates must be full-time exempt employees paid at least the DOL salary minimum. As of December 1, 2016, where this is not possible, the postdoctoral associate must be moved to a temporary, hourly non-academic position, with a pay rate and a non-academic title appropriate for the hourly duties, for example temporary service technician. Rockefeller University: Raising salaries. Salaries being raised above FLSA levels as of July 1 2016. Postdocs on fellowships less than salary levels stated are to be made up to stated level by the lab. North Carolina A&T: Still deciding. 11/07/2016: “We are finalizing the FLSA stages and will send a communication to you regarding any changes to your FLSA status or salary.” Information not updated for FLSA. 10/14/2016 FLSA overtime info does not discuss postdocs. Miami University: Tracking hours. Postdocs listed as non-exempt here. Northeast Ohio Medical University: Raising salaries. Oklahoma State University: Tracking hours. (Received confirmation 12/9/2016). Temple University: Raising salaries. Salary scales are being raised as of Dec 1st 2016 to begin at new FLSA minimum. Puerto Rico does not have to comply with the FLSA ruling under the terms of the Puerto Rico Oversight, Management, and Economic Stability Act (PROMESA). Brown University: According to their statement, it appears Brown will be allowing hours tracking of postdocs and, similar to the attitude of Brandeis, appear to count postdoc fellows as exempt, counter to federal definitions and guidelines (see blogpost on this issue here). Contacted 10/14/2016 for clarification, and reply received 10/14/2016 that the over-arching aim has been to raise postdoc salaries above the new minimum level. Further reply received 10/17/2016 passing request for info onto the Office of General Counsel and asked for clarification on how postdoc fellows are exempted when they don’t meet the teaching exemption, and still meet the “suffered to work” criterion of the FLSA. Clemson University: Unknown. No postdoc-specific information on FLSA website. Contacted 10/17/2016. Redirected to new contact 10/18/2016. Medical University of South Carolina: Unknown. No information. Not updated 10/05/2016. FLSA info does not mention postdocs as of 10/14/2016. University of South Carolina: Unknown. No postdoc-specific information in FLSA info. Contacted 10/17/2016. South Dakota State University: Unknown. No information, contacted 10/14/2016. Vanderbilt: Unknown. No information, contacted 10/14/2016. Texas A&M: Unclear and checking 10/31/2016 – website states that all employees below salary level will be tracked hourly, BUT mentions postdocs in FAQ AND lists postdocs as FLSA exempt under employee categorization. University of Houston: Not decided yet. 11/01/2016: “We are in the process of finalizing our decision and hope to have things wrapped up in the coming weeks to meet the potential deadline.” Info online unclear. Contacted 10/28/2016. University of Texas Southwestern: Raising salaries. Currently implementing minimum postdoc salaries at NIH NRSA levels from September 1st 2016, which will then be updated to the new 2017 FY levels to comply with FLSA on Dec 1st. University of Texas Health Science Center at San Antonio: Unknown. No information. Emailed PDA 09/22/2016. University of Texas Health Science Center at Houston: Unknown. Awaiting update for FLSA. Emailed possible PDA contacts 09/22/2016. University of Texas MD Anderson Cancer Center: Unknown. Information not updated for FLSA. 10/14/2016: Overtime info does not mention postdocs. Contacted 10/14/2016. University of Texas Rio Grande Valley: Raising salaries. University of Utah: Still deciding. “The University of Utah’s Human Resources department is evaluating the impact of this rule change on employees and departments. More information is expected as they assess options.” No new information as of 10/05/2016. No new information as of 10/18/2016. Virginia Tech: Unknown. Information unclear. 10/14/16: FLSA info does not mention postdocs. Contacted 10/28/2016. Washington State: Tracking hours. 11/02/2016: “The University will not be mandating that postdoctoral salaries the raised to the new minimum. Therefore, if the salaries do not meet the new threshold, their hours will be tracked.” Unclear. Contacted 10/28/2016. West Virginia University: Unknown. No information, contacted 10/14/2016. Redirected to new contact, contacted again 10/17/2016. Medical College of Wisconsin: Unclear. Contacted 10/28/2016. University of Wyoming: Unknown. No postdoc-specific information on FLSA, contacted 10/14/2016. UPDATE 11/10/2016: Possible effects of Drumpf administration on FLSA discussed here. TL;DR: FLSA updates go into effect Dec 1st and so institutions still must be compliant by then, and still can be penalized for violating federal labor law if they are not, even if the ruling is reversed. UPDATE 11/07/2016: Guide on applying for supplements to NRSA awards for current fellows to meet FLSA minimum issued by NIH: NOT-OD-17-002. UPDATE 10/25/2016: Changing Labor Laws Bring Increased Postdoc Wages – a blogpost for Addgene showing the data we have collected with 40 days to go until the new ruling takes effect. Currently over 40% of postdocs are estimated to see their salaries raised, but at most institutions it’s still unknown what changes are taking place. UPDATE 10/19/2016: Changes to employee benefits for scientists after FLSA – a look at how institutions are adjusting postdoc benefits as part of adjusting to the FLSA requirements. UPDATE 10/18/2016: Postdocs on fellowships: are they FLSA-exempt? Discussion of the merits, or lack thereof, of Brown and Brandeis claiming that postdocs on fellowships with stipends below the FLSA minimum are exempt. UPDATE 10/13/2016: States file injunction against overtime ruling: An emergency motion for a preliminary injunction has been filed by 21 states (Nevada; Texas; Alabama; Arizona; Arkansas; Georgia; Indiana; Kansas; Louisiana; Nebraska; Ohio; Oklahoma; South Carolina; Utah; Wisconsin; Kentucky; Iowa; Maine; New Mexico; Mississippi; Michigan). UPDATE 10/11/2016: All postdocs are federally recognized as trainees and employees: a discussion on Brandeis’ claim that postdocs on stipends are FLSA exempt. UPDATE from AAAS Policy Bulletin sent out 10/06/2016: “House Passes Bill to Delay New Overtime Rule. Last week the U.S. House of Representatives passed a bill (HR 6094) to delay the new Department of Labor overtime rule from December 1, 2016 to June 1, 2017. The new Labor overtime rule raises the income threshold—from $23,660 to $47,476—by which a full-time salaried individual would be eligible for overtime. The vote of 246 – 177 fell along party lines. In preparation for the floor vote, a group of higher-education organizations issued a letter to Congress in support of the bill arguing that the delay will allow universities and colleges more time to comply. A companion bill was introduced last week by Senators James Lankford (R-OK), Lamar Alexander (R-TN) and Susan Collins (R-ME).” Note: it is our (FoR’s) prediction that this bill is unlikely to pass the Senate; and even if it were to pass, the President will likely veto it. The vote to overtone that veto seems very unlikely as this bill does not appear to have bipartisan support.